Created by Brian Williams in August 2013. Last change 17 July 2018. 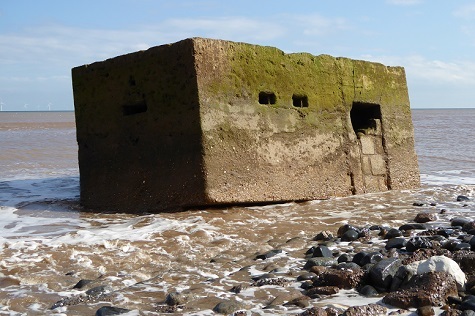 This page lists many of the military pillboxes and some other (mainly) wartime remnants found along the coast of the East Riding of Yorkshire, in situ and on the beach, presented from north to south. 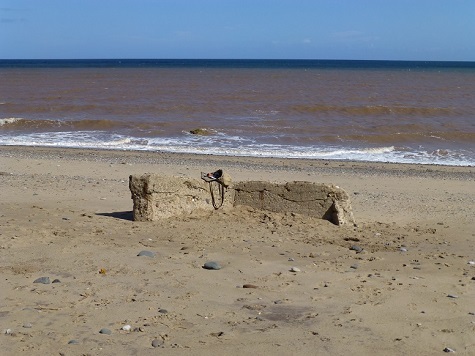 Because of their ease of recognition and relative durability, such structures where appropriately placed are convenient for illustrating the extent of coastal erosion as well as changes to the beach. 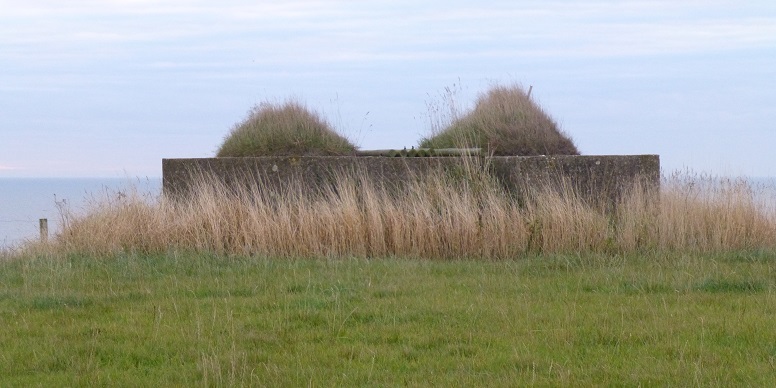 Most pillboxes in the list are of the lozenge type, a design specific to the north-east of England. Other structures are described accordingly. UK Grid Reference Finder is a useful tool for locating a listed item. Copy/paste the TA sequence – letters and numbers – into the Grid Reference box on the finder page, and press Go. 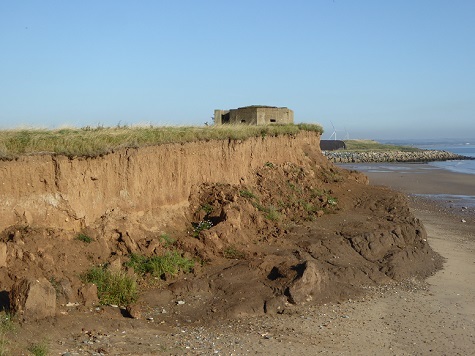 The pillbox pictured at the cliff edge on 22nd September 2017 served as a measuring point during the erosion post era of monitoring cliff recession. Between 1952 and 2010 (59 years), a loss was recorded of 104.84 metres, an average of 1.78 metres per year. The scaling rod is approximately one metre overall. 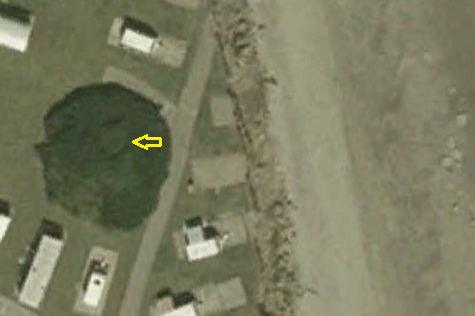 The arrow marks the location, lost under a mass of vegetation and about 15 metres from the cliff, of the pillbox at Ulrome Seaside caravan park in 2003. 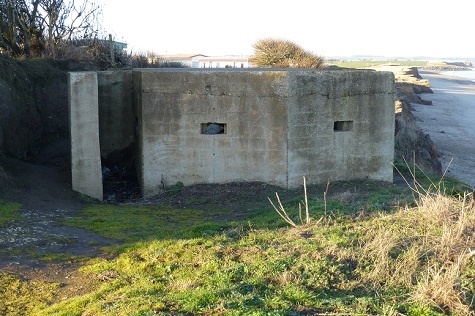 Taken 4th December 2013, the picture positions the same pillbox, with enveloping material gone, at the cliff edge. This structure has since been demolished and the debris removed. 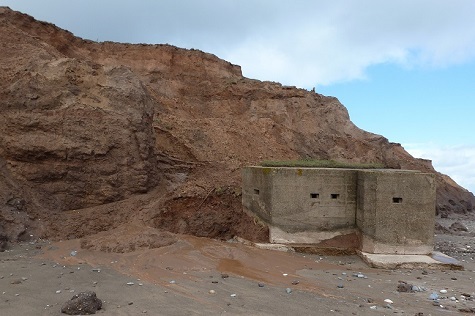 Although the pillbox at Mappleton is close to the cliff edge, defence works protect it into the foreseeable future. 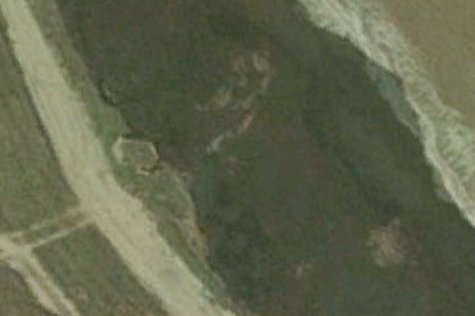 The newly descended piece, not fully on the beach when the picture was taken on 12 July 2017, was originally positioned within the MoD site. Propped against it is a scaling rod, approximately one metre in overall length. 23 1 43 F. EVINGTON. Two of the four East Newton boxes were erected close to each other, one being a larger departure from the more common ‘lozenge’ type, its function being different. 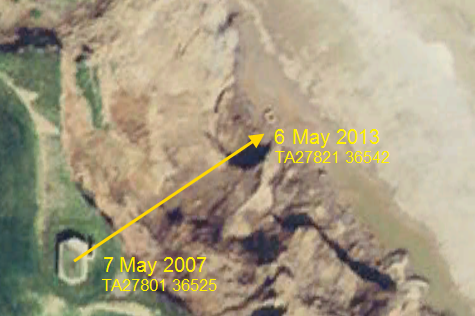 In satellite imagery dated early 2003, both structures are seen 27 metres back from the cliff edge. The southernmost unit descended the cliff in 2011-2012 (see Ringbrough and lower page at Sea Field Project). 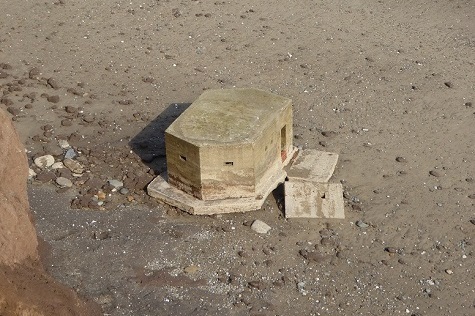 The above photographs demonstrate how a pillbox can be used for noting beach changes. 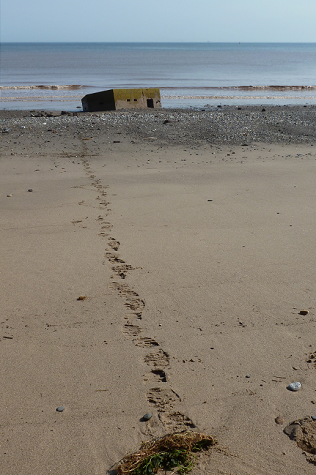 Taken on 27th November 2013, the first picture shows a full, sandy beach. 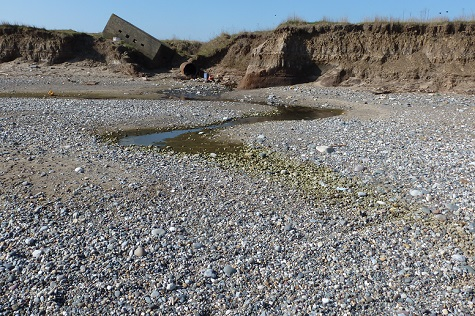 Compare this with the scene in the second picture, from 16th February 2014, where the upper beach is completely removed to expose the clay platform. In the background, the larger unit can be seen on its descent to the beach. 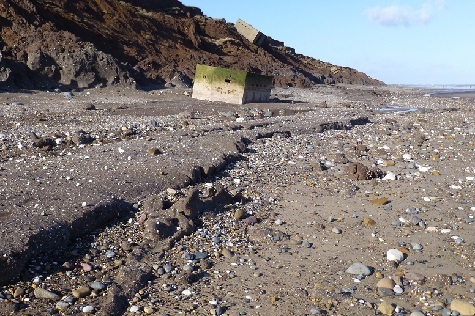 In its descent, the pillbox south of Ringbrough moved to seaward, by some 30 metres, as it followed the slope of the receding cliff face. Picture top right shows the structure recently deposited at the foot of the cliff, capped by a thin mat of vegetation, blast wall attached. 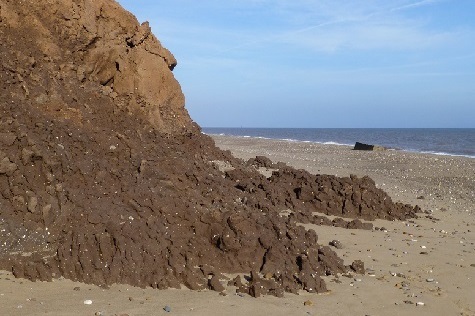 A mudflow oozes round it on to a low beach. The date is 5th May 2012. Bottom left, a year and a day later. 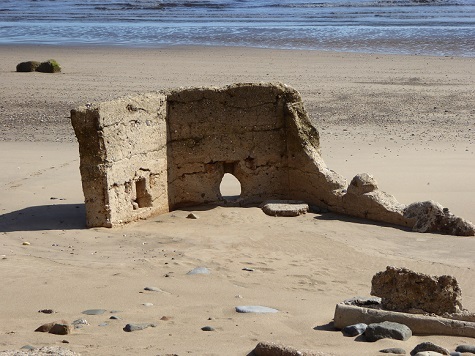 The blast wall is now detached and lies somewhere under high sand. 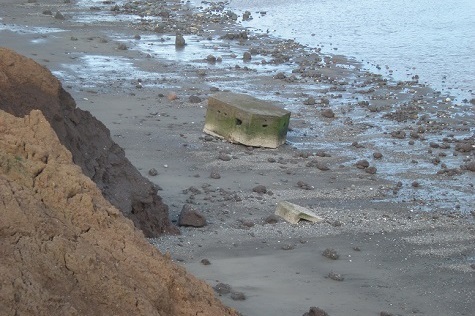 Another low beach, on 22nd September 2014, reveals the fallen blast wall. 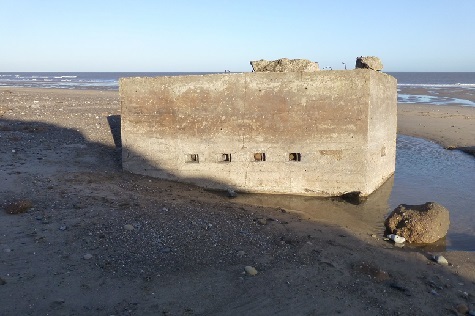 The ‘doorstep’, once supporting the wall, is now separated from the rest of the base and has dropped slightly. Similarities to the record at Ringbrough south. 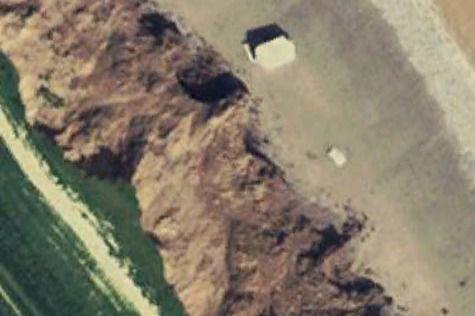 Top row: Satellite imagery depicts the southernmost Hilston pillbox at the cliff edge in 2003 and, using the same frame of reference, its arrival on the beach after cliff recession (image date May 2007). Middle row: The picture at left, taken 17th September 2011, sees the structure sitting on a thin beach after further positional disturbance, this time by wave action. 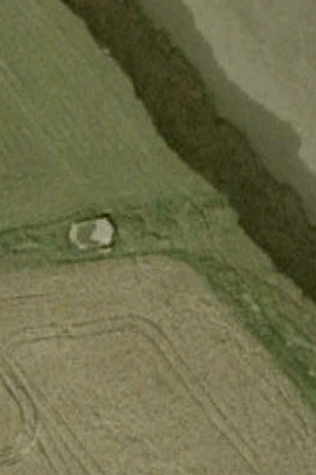 To the right, on 28th September 2013, the pillbox is largely buried. Bottom row: Intact but vulnerable on another thin beach, 22nd September 2016. 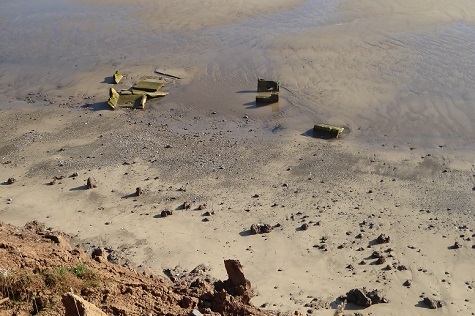 One year on, and Hilston beach pillbox is no more, the collapsed sections reduced to dispersing fragments, 2nd September 2017. 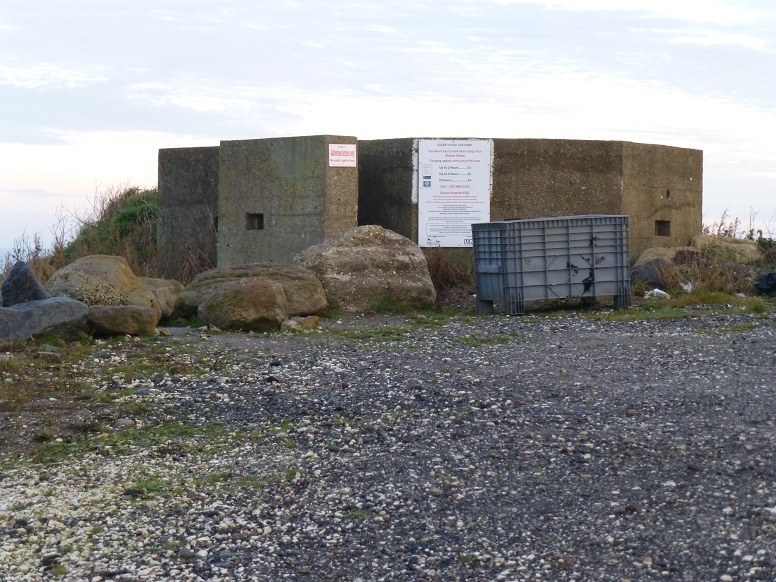 At the beginning of 2003 the Hollym pillbox lay 13 metres inland from the cliff line and by 2008 was at the cliff edge. On 3rd September 2012 the distance from its position on the beach to the cliff base was stepped out at 140 feet (about 42.5 metres). 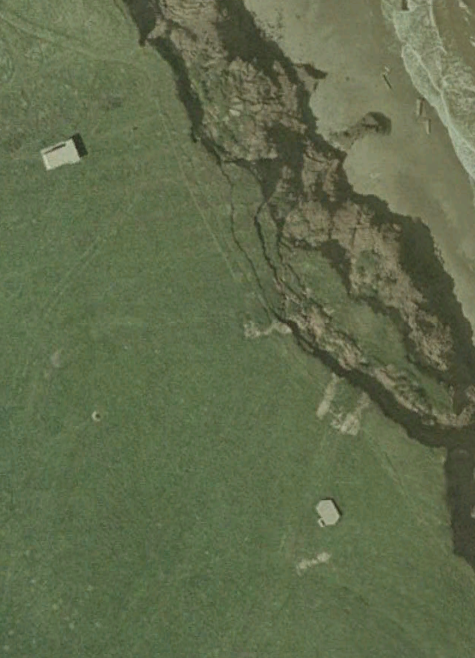 Satellite imagery dated 01/01/2003 places the pillbox 39 metres behind the mouth of the dyke. 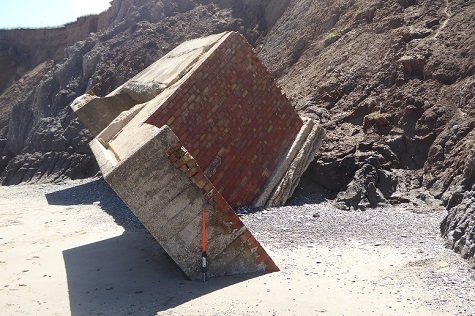 In spring 2013 the tilted structure could be seen about to be deposited on to the beach. Even smaller pieces such as this can be useful as reference markers for noting beach changes. 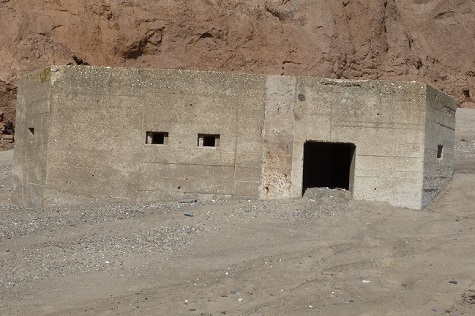 In the left picture, from 31st August 2013, the fragment serves as a rest point. The nearshore sea is discoloured brown as a result of eroded clay held in suspension. 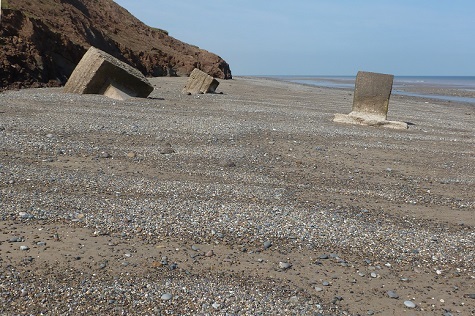 On the right, taken 30th May 2015, beach level is lower by a metre. 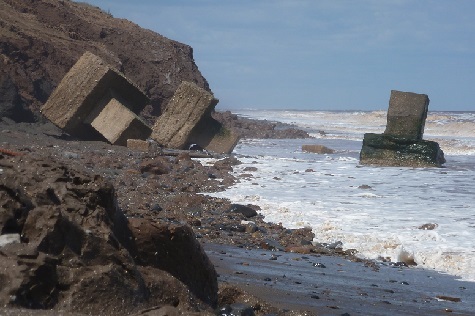 On the beach at the northern end of Dimlington High Land zone are three specifically shaped concrete blocks, with another in situ at the top of the cliff. The original function of the pieces, once grouped on (the highest) land, is believed to be as a mounting for detection equipment used by the military. As elsewhere, the objects assist in observing beach changes. The pictures presented top to bottom in the right column provide an example. 12th May 2012. 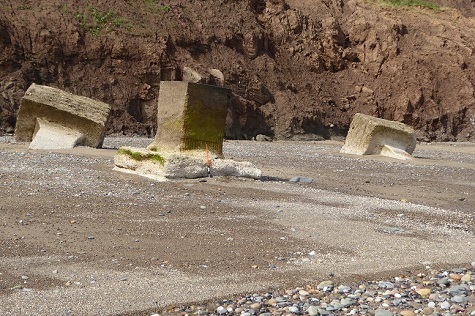 A very low beach exposes the blocks almost entirely. 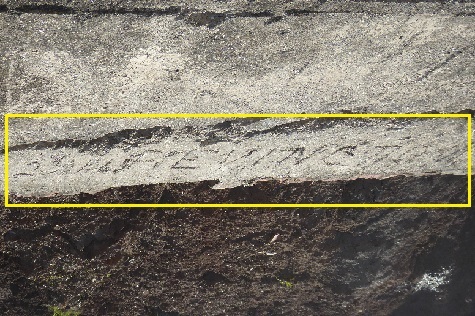 The accompanying mudballs are a sign of active cliff erosion. 3rd September 2012. The beach has a moderate-to-good cover overlain by cross-shore shingle. 31st August 2013. A runnel passes round the base of the nearest block while a sand ridge occupies the foreground. 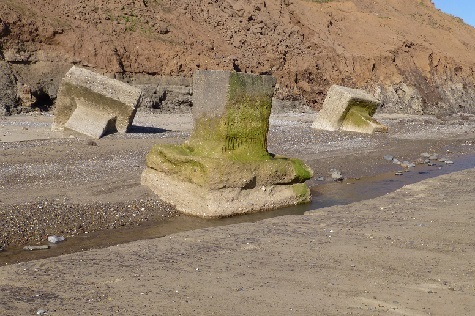 These identify a beach feature known as an ord system. 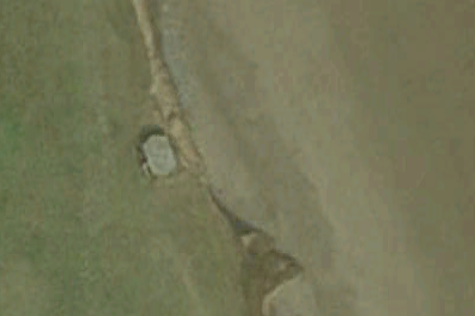 Upper beach shingle is cliff-parallel. 11th August 2014. The ord has moved on. A distinct transition from upper to lower beach is seen at lower right of picture. 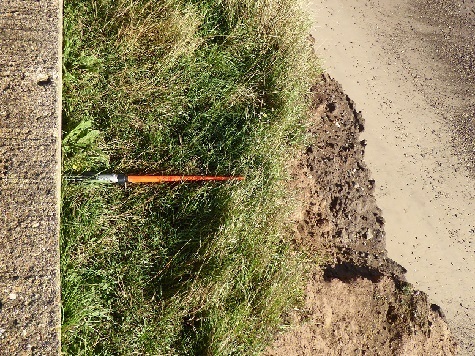 Propped against the middle block, a metre-long rod offers scale. 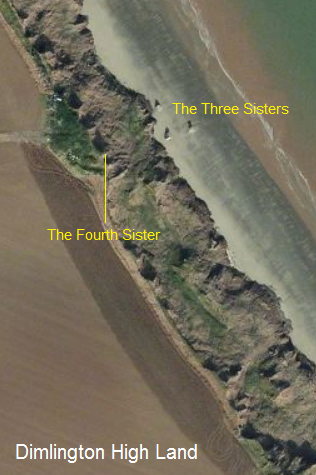 In the picture to the left, the Fourth Sister protrudes from the top of the cliff, not long to join the others [03/04/13]. The Fourth Sister has now started a descent [30/05/15]. 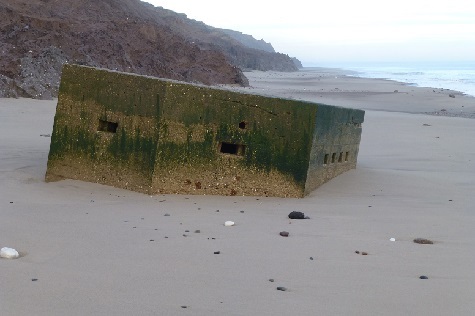 The south of Easington pillbox, which at the start of 2003 was perched on the edge of the cliff, lies on the beach upside down and open to the sky. 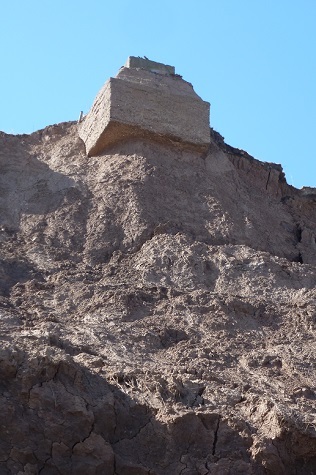 In the picture, taken 2nd January 2014, fragments of the base remain attached to the walls. 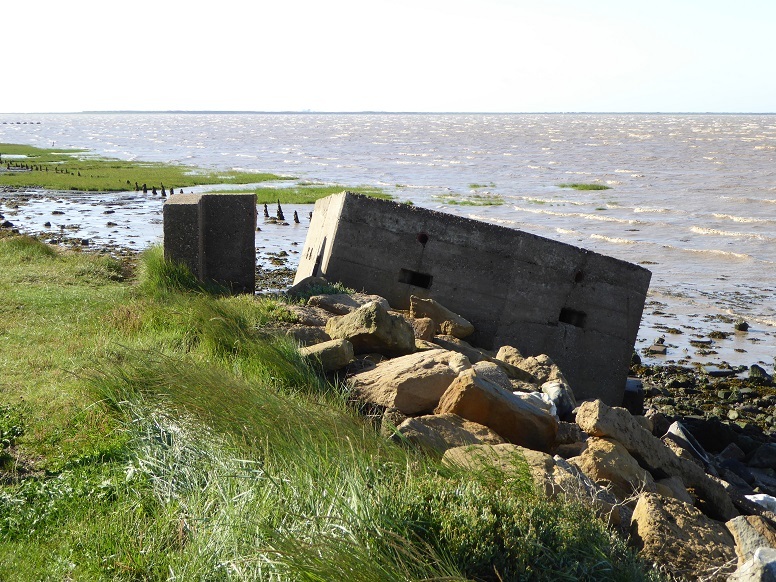 Only the blast wall retains original position as the pillbox at Kilnsea slips to the shore of the Humber estuary. Curving away in the distance is the Spurn peninsula. 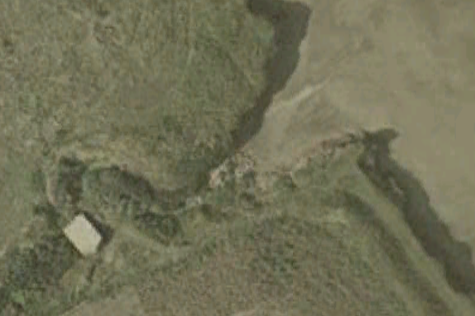 See Godwin Battery, Kilnsea page.